Once upon a Christmas time, many miles and years from here, there lived a small donkey. He was 14 unhappy years old, and he had worked hard and long for at least twice 14 masters. He was battered and scarred, and his tail was like a piece of limp rope, unraveled down at the end. One of his ears stood straight up like a cactus plant, while the other ear hung down like a wilted cabbage leaf. Yes, and his off hind leg had a decided limp. His name was Small One. His present master was a woodcutter, who also owned four younger and, therefore, stronger donkeys. The woodcutter’s son cared for Small One. He saw to it that Small One always had dry straw for his bed and that the load of wood to be carried to town wasn’t too heavy for Small One’s aging back. The boy and the donkey were very close friends. The boy, striving to hold back the hot tears, nodded his head. The boy picked up the old strap that was Small One’s single earthly possession and placed it around the little donkey’s neck. Following the wood path to the road, the small boy and the small donkey began their sorrowful journey to the town. People along the way wondered why the small boy was crying. They couldn’t know that he was listening to Small One’s hooves on the road—and the hooves seemed to beat out the words: “Going to tanner’s... Going to tanner’s... Going to tanner’s.” And all along the miles, the boy tried to think of some way to save his friend. It was late morning when the small boy and the small donkey went through the great town gates. It was market day and suddenly he remembered there was a horse market on the square! Yes, and if he could sell Small One to some new and kind master, the little donkey wouldn’t be killed and yet his father would still receive his piece of silver! There was no doubt at all in his mind that it would be easy to find an eager buyer for such a superior animal as Small One. Only one piece of silver? Why Small One was worth 50, yes, a hundred pieces of silver! The boy and his donkey were swallowed up by the crowd that moved in a steady stream, under the watchful, unsmiling eyes of the guards of the gates, toward the shops and markets of the town. It was high noon when the boy and Small One came to the horse market, a place filled with the shouts and loud voices of men and the acrid-sweet smell of leather and horse sweat. Tied to a long rail were all the animals to be sold: 20 sleek, beautiful mares and stallions, long of mane and tail, rubbed and brushed and combed until their coats glistened and shone in the sunlight like burnished copper or polished ebony. Holding tightly to Small One’s rope, and with his face streaked with dust and tears, the boy pushed his way to the platform of the shouting auctioneer. “Fifty!” The bidder’s voice rose shrill over the din of the market place. The auctioneer sliced at his neck with a thick finger and cried to see his imaginary head rolling in the dust. The crowd laughed at this pantomime, and the boy, taking advantage of this interruption, led Small One toward a man near the auctioneer’s platform. The boy and the donkey hid themselves in the crowd, and they were pushed and shoved until they were close by the auctioneer’s platform. And so, with the auctioneer’s fading voice in their ears, the boy and his donkey left the market place. The hours were slipping swiftly by, and before long he must start for home; and when he arrived there, he must have the piece of silver for his father. Two small weary legs and four old ones began a dogged, despairing journey through the town. A frantic childish voice called to people as they hurried by on the streets. 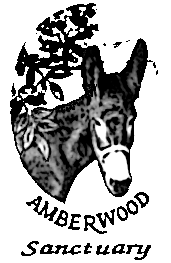 A trembling whisper spoke of a tremendous bargain at doors that were angrily closed with a shouted, “Be off with you!” No one in all the town desired to buy an old, tired donkey. It was close to sundown when the boy and Small One returned to the town gates and stood outside the tanner’s door. The boy’s hand fondled the rough brown nose, caressed the drooping ear, and patted the worn coat for the last time. Then, just as he lifted the latch of the tanner’s door, a voice spoke to him from the street. A bearded, poorly dressed man detached himself from the crowd that was moving toward the town gates. The man was looking at Small One’s drooping ear. “Small One.” The boy watched the man’s fingers explore the bottom of the pouch. Suppose the man was only joking like the auctioneer. Suppose he didn’t have the piece of silver. 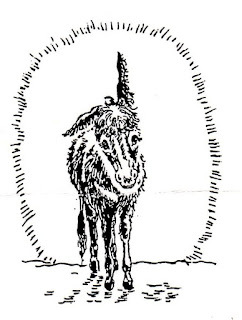 The little donkey seemed puzzled at the tug of a strong hand on his strap, and then he started slowly but obediently off at the side of his new master. The boy watched them disappear into the crowd, standing on tiptoe to catch a last glimpse of that one long ear that stood up straight as a donkey’s should. His happiness at having saved Small One’s life was now lost in the dreadful pain of losing him. Suddenly his legs started to run, carrying him through the crowd in swift pursuit. He overtook Small One and his new owner just a few steps from the great town gates. Standing in the shelter of the wall was a woman wrapped in the folds of a heavy traveling robe. There was suffering in the deep shadows of her face. Yet, as the boy’s eyes met hers, it seemed to him that a bright radiance shown about her head. It must have been his imagination or some strange and momentary reflection of the setting sun because this radiance faded away almost immediately. “All right, my son.” The man’s hand touched his shoulder. “We’re ready to start.” The old donkey lifted his head at the pull on his strap and moved slowly and carefully toward the gates. And so Joseph and Mary and Small One passed through the town gates, and the donkey’s hooves rang sharply on the stones of the road, and the sound was very much like music. And so, Small One traveled the many weary miles to Bethlehem. There, in a stable, he saw a king born, a king of men—of centuries—of life—of death. Yes, and Small One’s tired old eyes saw the Wise Men and the shepherds who came to pay homage to his small master. 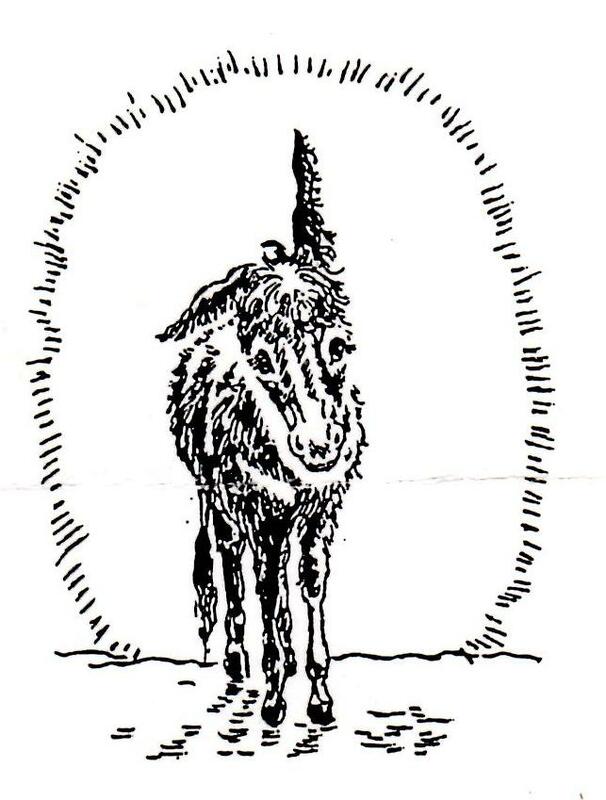 His dim old ears heard the voices of angels rejoicing, and the notes they sang were the very ones his own small hooves had rung out on the stones of the road. Then it came to pass that all those who had laughed at his ragged coat, and his limping gait, and his drooping ear, envied Small One, for he had traveled the road to Bethlehem to become a part of a great miracle. 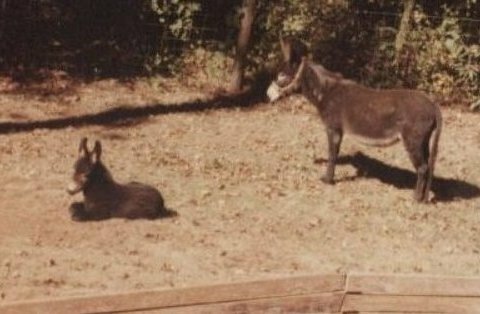 Oh, this was a long, long time ago, but even today, all small donkeys stand and dream—especially at Christmas time—dream of Small One, Small One of Bethlehem.